Archaeological finds lie aplenty in Rome. The Roman Forum was the core of the Roman civilization, it was the centre of religion, of trade, of politics and business. Since 1800’s archaeologists have strived to bring back to life ruins from temples and buildings scattered along the Sacred Way: the old main street of the Roman Forum. Today visitors can stroll the Sacred Way from the Capitoline Hill which belonged to Jupiter, stop by the old Senate House and the temple of the deified Julius Caesar on the way to the Arch of Titus to reach the Palatine. Palatine Hill ,is one of the 7 historical hills of Rome, cradle of the Eternal city and site of the imperial palace built by emperor Domitian in the 1 st century AD. 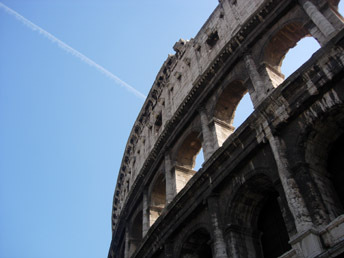 The Flavian Amphitheatre, better known as the Colosseum, is the true symbol of Rome and its greatness. It was built in a short amount of time to host man to man fights as well as hunting games, its capacity was around 60.000 people and it has been used for around five centuries. Descent the Hypogeum, the new opened underground area, and experience where gladiators and animals waited for their turn (subject to availability). Along with the Colosseum,the Pantheon is one of the best preserved monuments and the most awe inspiring one. A pagan temple dedicated to all the major gods of Rome has been turned from the 7th century into a working basilica dedicated to St. Mary. Its dome is a single shell of cemented masonry built in 125AD by Hadrian it’s still one of the largest (142 ft) in the world. The Circus Maximus was the largest stadium ever built, could contain 250.000 people. Here the Romans could enjoy the famous races with biga and quadriga chariots. The Baths built by the emperor Caracalla are one of the wonders of the Roman world. It’s where the Roman citizens met at the end of the day’s work to use the bathing pools or simply relax and have a good social life. The Ara Pacis Augustae or Altar to the Peace was built by decision of the Roman Senate to the first emperor Augustus who brought peace across the empire after twenty years of civil war. Dedicated to Augustus on the year 9 B.C. this beautifully carved marble altar is a testimonial to the heights reached by the roman sculpture. Castel S. Angelo was originally built by the emperor Hadrian as his mausoleum in 138AD. During the Middle ages became a jail, then a stronghold where the popes retreated in times of danger. Pope Clement VII took shelter there when Rome was set afire by the invading troops of emperor Charles V in 1527. Today the Castle of the Holy Angel epitomizes the Eternal City more than any other monument in Rome. From the core dating back to Hadrian to the Renaissance rooms frescoed by Raphael students to the terrace on top where one can enjoy one of the best view of the city.